a federally funded program to help prepare entrepreneurs to move toward commercialization. Through I-Corps, local teams learn to identify valuable product opportunities that can emerge from academic research, and student, faculty and staff innovation. Greensboro I-Corps will even help alumni to gain skills in entrepreneurship through training in customer discovery and guidance from established entrepreneurs. Through a competitive evaluation process UNCG & NCAT, joins a nationwide innovation network of I-Corps sites, and with this award have received a 5-year, $500,000 grant to become established as an I-Corps Site. With the new Greensboro I-Corps program students, faculty and alumni teams of UNCG and NCAT would be eligible to receive up to $5000 in mini grant funding to explore if their idea or innovation has the potential to become a scalable business. 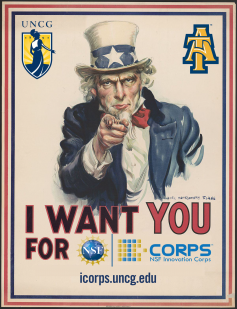 To learn more visit icorps.uncg.edu or come meet us at an I-Corps informational mixer.